Best of the Week: Samsung Galaxy Note 9 launch, Panasonic 4K OLED TV and more What Hi-Fi? | What Hi-Fi? A round-up of the week's highlights, including the Samsung Galaxy Note S9 and PMC's latest speaker package. This week, Samsung unveiled its biggest Galaxy Note phone yet, Fyne Audio secured funding to expand its operations overseas and Sony launched its cheapest 4K Blu-ray player yet. 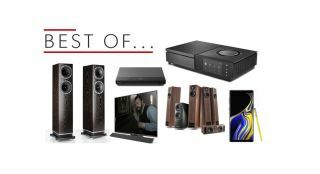 For reviews there was a raft of five-star efforts like Panasonic's TX-55FZ952B 4K OLED TV, PMC's Twenty5 23 5.1 package and Naim's Uniti Star system. Samsung's new Note has a big screen, big battery and big price. The entry-level edition comes with 128GB but if that isn't enough, there's a 512GB contender too. Its the biggest ever note at 6.4in, with a massive 4000mAh battery and the inclusion of a Bluetooth enabled S Pen. The 128GB costs £899, while the 512GB costs £1,099. Speaker brand Fyne Audio has secured £850k of funding to focus on growth. The sum from Bibby Financial Services is to help it grow internationally as the Scottish company looks to expand its scope. Considering the quality of its speakers so far, it's encouraging to hear it's got further funding. The UBP-X500 is Sony's most affordable 4K spinner yet. Hitting the £200 barrier, the UBP-X500 can handle 4K Blu-rays with HDR10, but it looks as if HDR10+ and Dolby Vision capability is off the table. It does support Dolby Atmos though. Expect to see it in UK stores from mid-August on. MQA audio: What is it? How can you get it? "the FZ952 and its sibling the FZ802 prove Panasonic is back and mixing it with the best"
There was a time when Panasonic's OLEDs were good, but not great. That has changed with its most recent efforts. The TX-55FZ952B sports bright and vibrant images, and bags of detail. It's also one of the best-sounding TVs we've heard too. It belongs among the year's best OLED TVs. "This speaker package is a whole lot of fun"
The last PMC 5.1 package we had ended up as part of our reference set-up. Guess which 5.1 system has just replaced it? The Twenty5 23 5.1 continues the brand's tradition for rhythmic intelligence yet is more detailed, dynamic and punchy than its predecessor. We can't find fault with what PMC has produced on a sonic level. "A great addition to the range, and if you need CD replay is the obvious choice"
We've enjoyed Naim's Uniti line of products. The Uniti Star is another consumate performer in the range. Offering an entertaining and informative sound, it's a capable unit with an extensive amount of features. If you need an all-in-one system, this should at the top of your list.